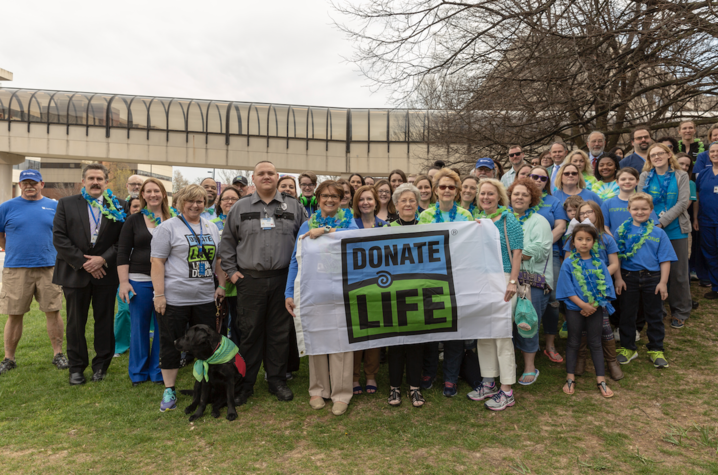 UK HealthCare and KODA celebrating Donate Life's National Blue & Green Day this past April. LEXINGTON, Ky. (Sept. 11, 2018) – UK HealthCare was among a select group of hospital systems nationwide recognized for promoting enrollment in state organ donor registries in a national campaign sponsored by the U.S. Department of Health and Human Services’ Health Resources and Services Administration (HRSA). The campaign has added more than 443,000 donor enrollments to state registries nationwide. UK HealthCare conducted awareness and registry campaigns to educate staff, patients, visitors, and community members about the critical need for organ, eye, and tissue donors and, by doing so, increased the number of potential donors on the state’s donor registry. The hospital earned points for each activity implemented between October 2017 and April 2018 and was awarded platinum recognition through the HRSA Workplace Partnership for Life Hospital Campaign. Of the 1,283 hospitals and transplant centers participating in the campaign, 468 platinum awards were awarded during this phase of the campaign. UK HealthCare worked with Kentucky Organ Donor Affiliates (KODA) on the campaign. See the full list of hospital associations and hospitals recognized here.